Grilled Chicken, Lettuce and Scallions: Marinate the chicken for at least 3 hours. Bring it to room temperature before grilling. Brush lettuce and scallions with olive oil and season lightly with black pepper and sea salt. Light up the charcoal or prepare the gas grill for direct cooking over medium heat. Grill and baste the chicken with additional oil until the chicken is fully cooked. Let the chicken rest for at least 2 to 3 minutes before slicing. Grill the lettuce and scallions about 6 to 7 minutes, turning once or twice until they are tender. Salad Dressing: Whisk together the lemon juice, coriander, chili flakes and olive oil until emulsified and season with sea salt and pepper. In a large bowl, gently toss all the salad ingredients with some salad dressing and season with salt and pepper, if necessary. That looks like a great salad! Loved the chickpeas and the dressing. I love adding fruits into salad too, give the salad a delicious sweetness! Not to mention so pretty too! This looks incredibly healthy and so pretty too. This salad sounds wonderful! Yum! Looks beautiful and healthy. Love the ingredients you have used. That photo is enough to make me salivate! 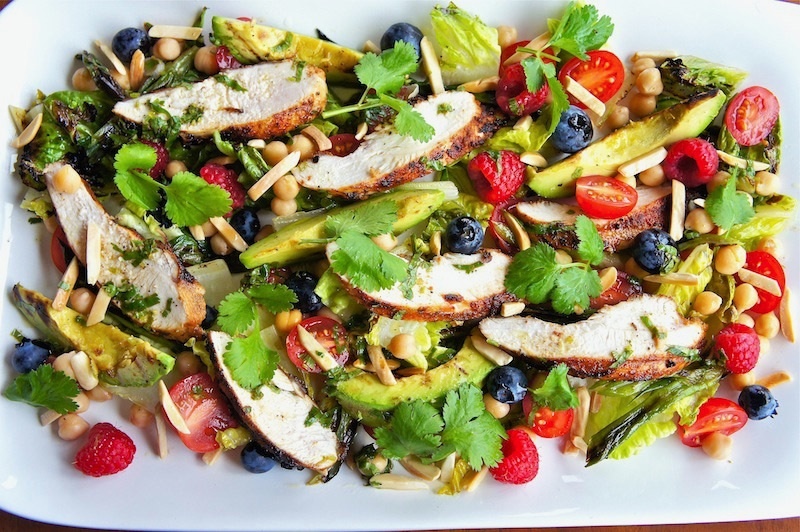 I love the idea of mixing nuts and berries in the chicken salad - I bet the salad's really flavorful (not to mention colorful too)! I tried this recipe and I have to tell you that it was absolutely amazing. It was so good that I opted not to have any dressing with it. Thank you. Thanks for the feedback Stephanie! !